The maximum fine levied by the Environmental Protection Agency is $11,000.00 PER DAY, PER PROJECT. These fines can quickly halt your construction efforts and severely jeopardize your profits. Prepare for enforcement within the city or county you are working in with the use of Outpak Washout products. 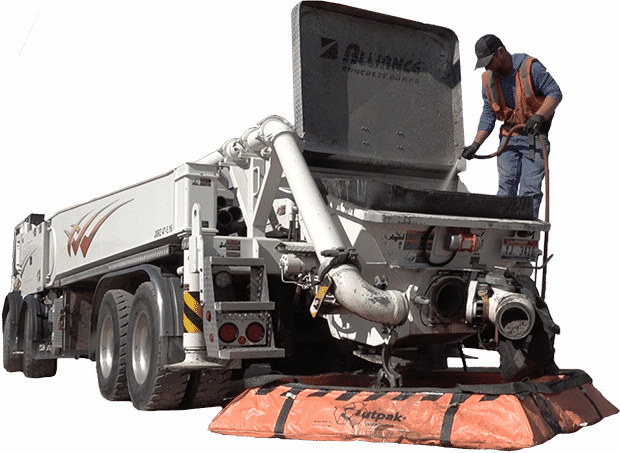 There is no faster or easier way to manage concrete, and other construction waste washout than with our products. Outpak Washout products are easy to store and just as easy to deploy. The Outpak All-Weather Washout is also designed for a quick and easy set-up but can remain for the long term duration of your project without filling with rain or absorbing ground water. We carry sizes for both mixer and pump trucks. Most importantly, Outpak Washout products are easy to dispose of after evaporation and job completion. “I wanted to take a moment and let you know what a great product you have. We are using the 4×6 and the 6×8 size washouts on several of our projects, and it is extremely cost effective to use your product. By the time and the efforts it takes to go build and put a liner in a small pit, you could have several of your washouts setup and ready to use on various locations on the same site. They have been so hassle free to use and dispose of. It really has taken all the stress, time and resources away from having to worry about building and maintaining a proper concrete washout on-site. Rodney BaxterGeneral Manager Concrete Division | Petra Inc.
“Here in the Puget Sound most of what we build is either on waterfront or a drainage area so we have to be very conscious of our environmental practices. The Outpak washout system has been a welcome solution. In addition to using the Outpak for concrete washout we have introduced them to our masons, painters and drywallers for their clean up needs as well. We pride ourselves on being organized and meticulous builders not only with our building practices but also with our jobsites. It is a trademark of Olympic Ridge Inc that has brought us much business over the years. The Outpak system helps us accomplish that goal and achieve a high environmental standard. E. J. KlinkerPresident | Olympic Ridge Inc.